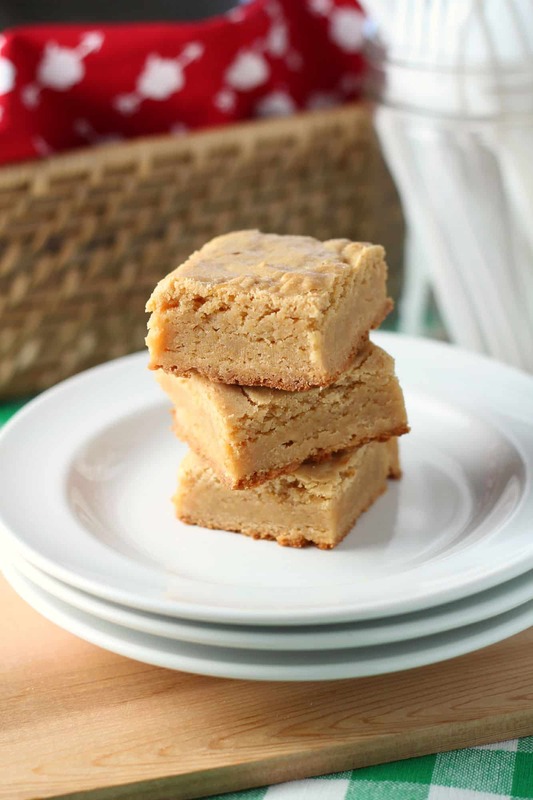 Blondies may be the better half to a brownie– the same square, portable treat but without the heaviness of chocolate. 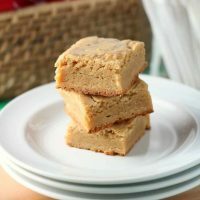 The combination of granulated and brown sugar creates a chewy bite that makes it tempting to eat more than your share of each batch of blondies. Make these in a 9 by 13 pan and be ready to feed a crowd. 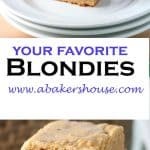 My favorite blondies recipes include white chocolate and macadamia nut blondies and smores blondies. School may be back in session here in Colorado but summer is not yet over– you will not find pumpkin recipes here on my site in August! We’ll celebrate autumn in all of its glory…in another month or so. Let’s get outside and enjoy the beautiful weather that Mother Nature offers while we still comfortably can. We’ve lived in Colorado for eight years and still have so much of the state to discover. I hope we can find time for a mountain hike in the coming weeks (most likely on a weekend); pack a picnic, bake one of these picnic-perfect desserts and come along! The #CreativeCookieExchange is busy baking picnic cookies, bars, and other delights this month. To me, a picnic dessert needs to be 1)easily packed, 2)melt-proof (no chocolate chips or icing please), and 3)a crowd-pleaser. These BLONDIES fit all three categories and will quickly become your go-to dessert for picnics, school lunches, and pot-lucks. The recipe I followed comes from a Williams-Sonoma cookbook called Dessert of the Day and their recipe for Crunchy Toffee Triangles is a keeper. I took the recipe back to basics and removed the toffee bits (prone to melting) and the almonds (nut-allergy not best for a crowd) and the result is a fudge-like, rich, blondie that rivals a chocolate brownie on any day. Recipe from the Williams-Sonoma book, Dessert of the Day, page 231, slightly modified to omit almonds and toffee bits. Spray a 9 x 13 pan with baking spray. Line with parchment such that two lengths of parchment criss cross and hang over the edges. In one bowl combine the flour, baking powder, and salt. In a stand mixer combine the butter and both sugars until light and fluffy, then add the eggs one at a time. Mix in the vanilla. Slowly add the dry ingredients to the mixture in the stand mixer and continue to beat on low speed until the dry ingredients are combined. Scoop the dough into the prepared pan and spread out as best you can. Bake for 25-30 minutes. The blondies will have a golden brown top, especially around the edges, when baked. Let this cool completely-- resist the urge to dig in right away!--the blondies will settle and continue to firm up as the cool, making it easier to cut them into squares. The theme this month is Pack for a Picnic Cookies–any kind of cookie that sounds great for a picnic! If you are a blogger and want to join in the fun, contact Laura at thespicedlife @gmail.com and she will get you added to our Facebook group, where we discuss our cookies and share links. Love the addition of almonds and toffee bits. A true blondie ramped up with great flavors. I love a blondie, Holly! Great choice for taking along on a picnic. I have never made a blondie and these look so very good!!! I love getting new cookbook recommendations and a chance to try a recipe out from them! These look great! Now I understand why I’m seeing Autumn stuff everywhere… school doesn’t start until the week after Labour Day in Canada, so when school starts is when we allow “fall” things to start, lol. I never understood the desire to say goodbye to summer so soon. These look so good and would be a perfect fit for any picnic. I love the squares, too, so easy to pack. Delicious Blondies… Great for picnic trip..
No No No.. summer is NOT over YET or ever ..LOL. sometimes I wish I could tell people to hold off on their pumpkins until December. School for us starts in two days .I haven’t ever made a blondie, Holly. Yours look so good that I am tempted to try them as soon the cookies I made finish up. I love your rules for picnic cookies and pretty much concur with all of them! The bars look decadent and delicious–great job! These are gorgeous Holly, and perfect for a picnic! And yes, it is still summer!! These sound delicious and they look so good! I think I’d add back in the toffee bits but otherwise perfecT! I’m with you! No fall recipes yet, even though I am bathed in it at work. These blondies look wonder. Still have time to pack these in a picnic basket and enjoy the warm weather. I love blondies! Enough said, right? But I hope you get that hike! Yep, these bars are perfect for a picnic! I think they would be perfect to pack for your other Colorado adventures too. I will have to look into that cookbook too if they have more delicious recipes like this one. I love you and am so with you. Summer is short enough isn’t it? I saw someone pushing a CHRISTMAS cake on Facebook the other day…whoa!! Haven’t the last two days been amazing? I’m not ready for fall but a bit cooler I’m OK with!